Il faudra sérieusement se retrousser les manches pour remettre en état cette Porsche affichée à 82’500$. Retrouvez cet ouvrage dans l’eShop PassionPorsche. Just under three years ago, Jerry Seinfeld sold off 16 cars from his collection, ranging from a trio of 356s to a 962C. This high-profile sale with Gooding & Co. attracted substantial attention at the time, including several features on this site. In keeping with such a high-profile sale, each car was subject to the scrutiny of not just the internet commentariat, but experts from the auction house who were responsible for vetting each vehicle. Despite this, more than two years after the sale, it is alleged that one of Jerry’s cars was not all it appeared to be. 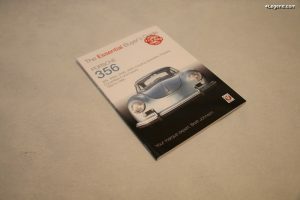 Jerry’s 1958 Porsche 356 A 1500 GS/GT Carrera Speedster, now owned by FICA FRIO Ltd., is allegedly not legitimate. At this time, the terms of what makes the car anything other than what it appears have not been made public. As our Bradley Brownell pointed out in a piece for Jalopnik earlier this month, determining authenticity with a car of this type can be extremely problematic. Where road car owners can often rely on a Kardex report to verify their vehicle, old racing cars lived much more challenging lives. Chassis and engines seldom match after years of hard use. Tracing a particular car’s history can be extremely difficult, whether it was factory or privateer-run. The Typ 692/0 four-cam engine in this car (a late production Hirth roller-bearing crank version) is original to the car, though the car is not original to the engine. The engine originally installed in this car, no. 91015, was first installed in another GS/GT Speedster, chassis 84912, sold new to amateur racer Leo Levine. Shortly after taking delivery of his Carrera Speedster, Mr. Levine requested that the Speedster’s four cam be replaced with a pushrod 1600 Super; the Speedster’s 692/0 engine was then placed in 84908 prior to its delivery. The type 692 is essentially identical to the earlier 547 engines, though updated to the V-drive type distributor to make timing a slightly less difficult affair. Significantly, the hood and deck lid are both stamped with the last three digits of the chassis number (908) and the engine type and serial number stampings (692/0 and 91015, respectively) match the factory records. As would be expected of an award-winning show car, this Carrera Speedster is offered with a Porsche Certificate of Authenticity, copy of the factory Kardex, tool roll, jack, and handbook set, which includes a 356 A owner’s manual, Speedster driver’s manual, and supplement for cars with the 1500 Carrera engine. The car was acquired in unrestored condition by a broker in 2010, and subsequently restored by European Collectibles. The engine rebuild was handled by the late Bill Doyle of Rennwagen Motor Company; himself one of the leading experts on Porsche 4-cam engines. Following this car’s restoration it achieved a first-in-class finish at the 24th Annual Dana Point Concours d’Elegance hosted by the 356 Club of Southern California. Later in 2012 it appeared at the Quail Motorsports Gathering, where it was selected as Best in Class amidst a field of 59 postwar sports cars. Following assessment by a Porsche expert and Historic Porsche Dealer (alleged to have been Maxted-Page in the UK), FICA FRIO has claimed that this GS/GT is not as it was represented during the sale. Critically, FICA FRIO Ltd. have not released any information regarding what makes the car inauthentic, or by what criteria it was judged. Based on released statements, Jerry offered to purchase the car back from FICA FRIO Ltd. for the full purchase price in June of last year by voicemail. Evidently, this did not occur. FICA FRIO have launched into a suit against Seinfeld for both the purchase price and massive punitive damages. Ideally for Mr. Seinfeld, this issue can be settled directly between the restorer and the current owner, and without his input. Without more substantial information regarding the claims against the car, it is impossible to say beyond broad conjecture which party is in the right here. We certainly can’t imagine that Jerry would not misrepresent a car knowingly. And we’d love to see the information that FICA FRIO has found that indicates it to be faked. Both the Associated Press and Jalopnik have reached out to European Collectibles for statements on this matter, though at this time neither has published any response from the restorers. We will update if additional information comes from any of the three parties involved.